So I was thinking of how a few more series I love will be drawing to a close soon. Melissa Marr's Wicked Lovely series will come to an end next year. I'm very sad about this to be honest, as I really love these books and this world. 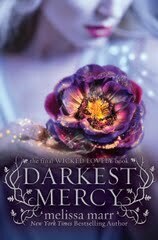 I think the cover of the final book, Darkest Mercy, is one of the most beautiful covers I've ever seen. I'm happy to have all of these stunning books in hardcover. Another series that will be coming to a close is Carrie Ryan's The Forest of Hands and Teeth. These books are responsible for my newly discovered love of zombie stories, and I really love visiting this strange world. I have the first two books in hardcover, but due to a design change, they don't match. 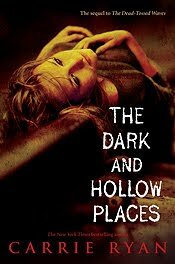 I love the cover for the third, though, coming out next spring, The Dark and Hollow Places. Another series that will be closing out next year that I enjoy is Maggie Stifvater's Wolves of Mercy Falls books. Sadly, I do not have these books in hardcover (ARC only) because I think they are some of the most beautiful books I've seen. Maybe they'll release a boxed set I can buy? Are any of your favorite series coming to a close soon or in the next year?